Spring is just around the corner! It isn’t too late to start your seeds indoors. Being with plants and nature is beneficial for mental health and stress management as well as an essential tool for your Chronic Pain Toolkit. Here are 7 simple tips to help you get started! First things first. Make sure you have what you need to help manage your pain (and the mess) before you start your seeding process. Once you start, it will be hard to stop until it is completed because it is fun and messy! I usually take a week to plan. By the weekend, I have an entire day to get some nature therapy in. You will need some good seed starting/potting material and containers. Save money by re-using egg cartons or other materials (newspaper or toilet paper rolls) for the container. I’ve seen people re-using plastic fruit containers and even a rotisserie chicken container! If you don’t have time or energy to look around and be creative, simply purchase a ready to go seed starting kit . You can get seeds from various places. Once way of saving money is to save your seeds from the previous year. 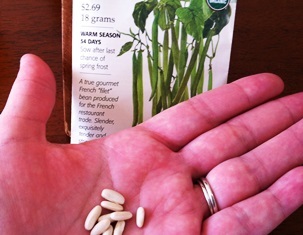 Another way is to swap with friends which is a great way to get heirloom seeds for free! I’ve also seen seeds at our annual plant swap. Or, you can spend the money and purchase new seeds. I tend to go with seeds that I know are organic. Now it is time to get your hands dirty! Get your seed containers filled with your potting material and bury the seeds to the depth that is needed per instructions. Some people use gloves and little shovels or spoons. I prefer to have the contact with the dirt and the seeds. 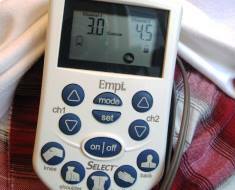 I find this is important for therapeutic benefit. In this photo (left) I used a plant marker that I cut in half and purchased from the store. 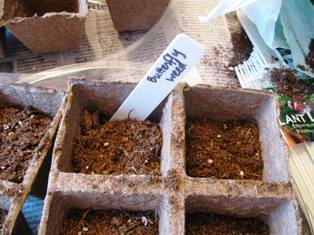 I have also re-used popsicle sticks and plastic spoons to label seeds. Make sure you keep good records! Keep a journal of when you planted the seeds along with the seed package or instructions on how long they should take to germinate. This is important because I have a hard enough time as it is remembering things with my Chronic Pain Brain. 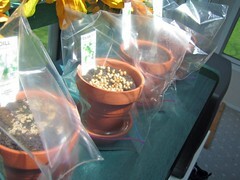 Seeds need warmth, light and moisture to germinate. Warmth: some people use a warmer heat mat for under their kit. I have found that using a mini-greenhouse with lights does the trick. Light: place closest to a window with natural light or purchase grower lights. Moisture: Spritz with water bottle daily to keep moist. Having a “greenhouse” is essential for keeping the warmth and moisture in. I have an indoor mini-greenhouse with shelves that is easy to put together and take down every season. I’ve seen a plastic baggie placed over a pot. I’ve seen water or 2 liter bottles cut apart and used. I’ve also seen fabulous wooden indoor mini-greenhouses. 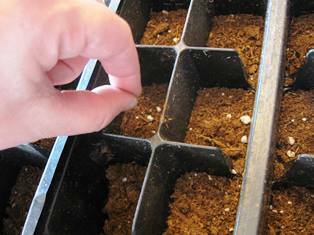 Once your seedlings are big enough to transplant, you can move them to bigger pots to continue growing in your greenhouse or plant them outside. When they’re ready to go outside, you will need to know information about how to sow outside. This includes how long to wait until after the last frost, row spacing and how much light and water they will need. 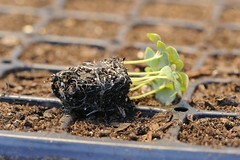 Once you’ve planted all of your seedlings, enjoy them as they grow into fruition! Pain Camp is a safe place to share your thoughts, experience, strength and hope. Have you already planted your seeds? What have you planted? What does your greenhouse look like? Yay!! I did buy a seed starting kit, and it is on my shelf waiting for the right time to start the seeds. With it being below zero today, it seems impossible that spring will ever really come!! 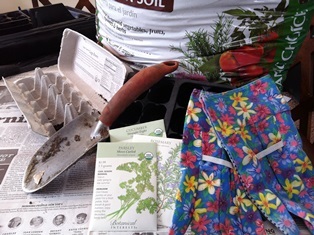 Congrats Pain Camper Colleen on your purchase of a seed starting kit! Read the back of your seed packages for the best time to start them or you could just plant them tomorrow to celebrate the first day of spring! 🙂 Peace and blessings.